Happy Emperor Norton Day! I hope I am a free man when this appears! I have to tell you the truth: I don’t think you are going to hire me. It is true that I have a lot of strong features on my resume. I am not the most bubbly person, but I am compassionate. I make time to listen to those who come to me and I leave them with encouragement even when on the inside I don’t feel much hope for myself. Sometimes I get angry, but I know how to forgive. I have given unselfishly of my time. I am probably too intelligent for this job, which will lead people to think that I am arrogant and elitist but the truth is that I have found some kind of intelligence worthy of respect in every person who I have met. I’m getting old. I know this job would help my self-esteem — I know I can perform beyond expectations, but all you see are the white of my beard and the gray in my hair. Maybe you have heard rumors. My mother, who was a negative person, is beginning to sound right when she said that the good things always go to someone else. I will not stop believing that I am a good person and competent, but truth be told, I don’t believe that there is anywhere for me. You’re no different from all the other employers who have interviewed me. You have the same strange prejudices and preferences for youth and people who know how to hit a baseball. You will hire someone else who will probably disappoint you. You will have missed your chance, but because of you I will have missed out on having a job I can live for. The last day I attended class at the University of North Carolina, I stopped in a diner that I had never seen before, one that stood overlooking the road linked Durham and Chapel Hill. I ordered breakfast because it was mid-morning. The other patrons — the regulars — all turned to look at me, giving me that interested stare that they gifted all strangers. Then, to a person, they resumed chatting or looking in their coffee cups. I ordered pancakes with a side of sausage, then spent the meal cutting pieces off the pancakes never looking at the other customers. When the waitress slammed the bill on the table, I was staring at the lingering grease and maple syrup. This was a last day and I was sad. Blue light, still as it makes everything still. The bookshelves, the mirrors which are reflecting nothing except the blue light shining off the sheets of the bed. That is nothing to the mind, something to reality because there is no emptiness in the universe. Even in the far reaches of space between the solar systems there is something slowing down the spacecraft hurtling through the emptiness past the birthplaces of the comets, past the dust of the planets that never got to be! I cannot see those tiny worlds because even when I stand under the clear desert sky I cannot see them. I wouldn’t call them invisible because that darkness is not like the darkness of a cave, but a lit darkness like that of my room. What they had seen! I remember them behind his glasses, staring intently at a book or squinting at the punch cards he was sorting for work. He was a slow reader, but then I was a frantic one so perhaps I held him to an impossible standard. When he beat me, I don’t recall that they glowed or showed particular anger. They were set to the task and nothing more. Had they shown terror once as he watched all but three members of his company fall before German guns? He never spoke of that to me and there were no images hanging in his eyes, no memories of the War that he shared with me. I did not cry when my mother wrote to me in Greece to tell me that he was dead. …when I walked into the door and broke my nose — off. I felt around for it, letting my fingers become corneas and pupils. What had become of it? I felt grit and the dust, the bits of rock I had tracked in from the desert surrounding my rock house. Out here there was no electricity, so I had no lights except a lantern which was out of kerosene. Damn the door! Then I pursued the only solution available to me: opening the door to let in the moonlight. I did this slowly until it stopped on something soft. My fingers tickled the underside of the door until I had my nose in my hands. I picked it clean and reattached it. I burst out the door. A new life! A new life! I couldn’t get to the car fast enough. The sun slammed into the ground. That tired old company with its dirty tables, dirty warehouse, dirty plastic injection molding machines in a filthy factory was over. They had lost customers and they have shoved me and most of the rest of the staff and workers out the door. Blessed was that moment. Was it a depression that waited for me I get to get through this mania with all its miseries. In a few weeks, I would be in Croatia writing reports for the Internet about peace groups and what I saw of the war. Enforced sadness in those days to come, a public face to hide the exuberance that came with having a new passport, money for a train-ticket, and a thousand dollars of traveler’s checks in a country where life was cheap. I was unemployed as far as the state was concerned but I was laughing at all the people who stayed behind in those filthy factories of the South Bay. They could have the dirt, bury themselves in it if that was their wont. I would never go back. I made my break clean and complete. They could have it all. I wanted no references, no memories of it. No more applications. No more enduring the micromanagement of a boss. Then beyond all this rabid exuberance — the crash. In my manic days, I told everyone. Their eyes darted around the room as if checking the escape routes. Eyes that told me that I was a freak, that I was dangerous. Shame is how I feel about those days. Looking back leaves me with a heaviness in my chest, a surge of blood in my head that can turn into a headache. I keep it a secret now. I don’t share the knowledge — not with my neighbors, not with my fellow students — except I have revealed myself in Toastmasters where I told the story of my journey to a diagnosis. It was a tale of knives and crazy text messages. I knew they would feel badly for Lynn, but how would they feel about me? Once I had finished, it was out there. And no one attacked me, no one told me that I should leave the club. 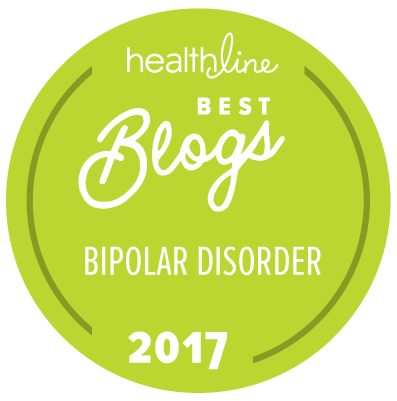 I have told exactly one neighbor — when Lynn had uterine cancer — and she told me that she lived with bipolar disorder, too! And so did another neighbor! I have not told the others. They don’t need to have this tidbit for gossip, they don’t need to worry that I might be a child molester or a knife-slashing maniac. My angersometimes gets out of control but it hasn’t happened in a long long time. The neighborhood has no need to know. Kierkegaard. I had to read him in college except I didn’t read him. I set the book on my bookshelf and I concentrated on understanding him through my notes. K talks about a leap of faith, that moment when you have squandered all your options and the only thing to do is face the chasm and jump to the other side, There I go, intellectualizing again. I cannot recall any time when I found myself on the edge of life like that. Or I was a coward and I didn’t jump. Other people are impressed by me, but I am not. I have the least good opinion of myself except for this guy in Toastmasters.